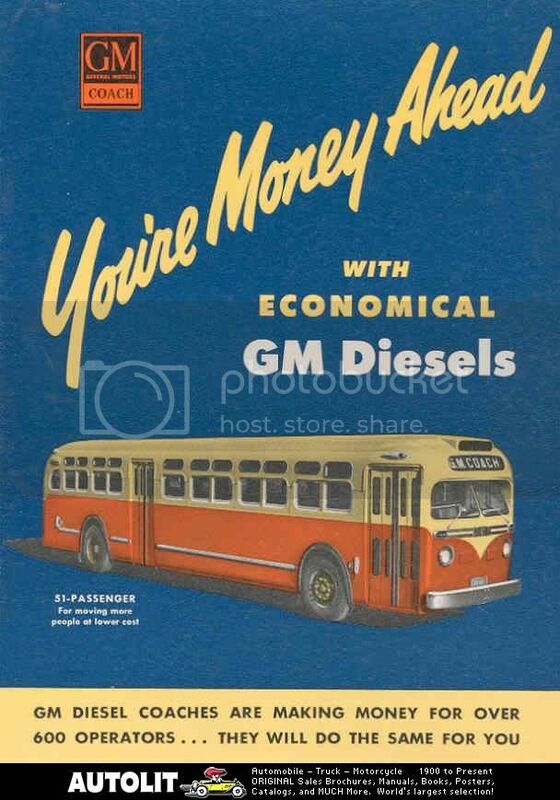 Just thought you'de all get a kick out of some interesting vintage bus advertisements (as I find more, I will add them to this forum). 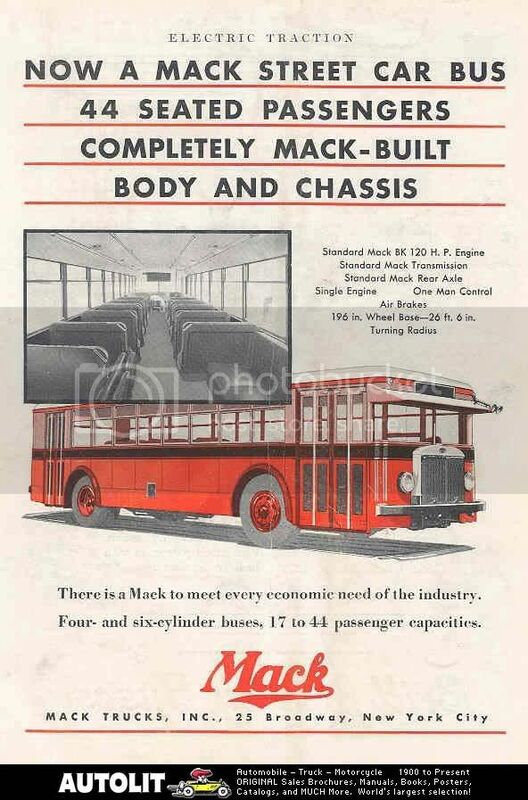 Pictured below is a promotion probably from 'Bus Transportation' magazine (the bible of the industry in those days) touting Mack's latest entry to the transit field circa very early thirties. Below that is pictured Green Bus Line's only 1933 Mack model 6-CL-3S (ser# 1006 - Fleet # G447) which came from the same lineup. Green Line photo courtesy of the Mack Truck Museum. Street car bus = modern day BRT? I would have to say that they definitely deisigned these Macks with trolley cars in mind. It must have been funny looking way down the street, seeing one of these buses and not really knowing whether it was coming toward you or moving away! I remember Jamaica's Twins of similar design on the Far Rockaway route as a kid and I could never figure out which way they were going! I imagine it would have been tough with the Twins. At least the Macks had the radiator in front. 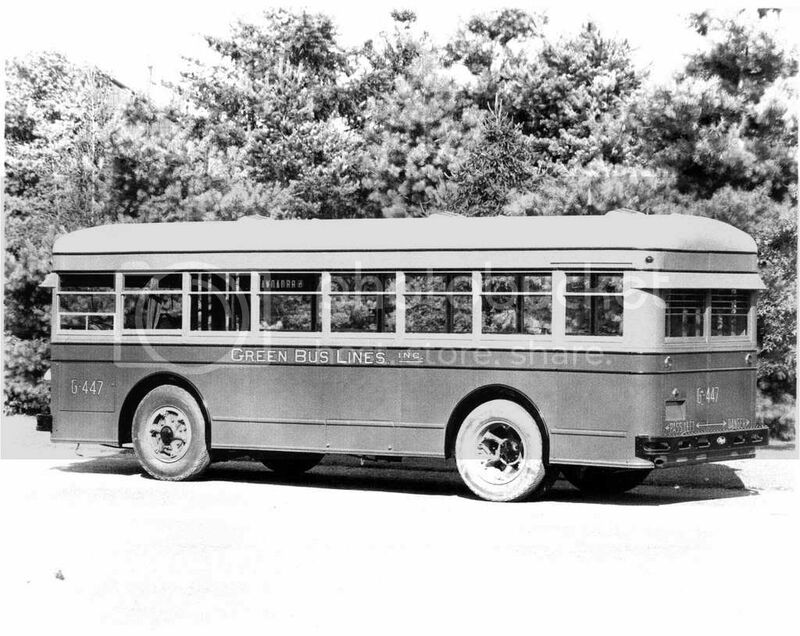 Pictured below (left) is a Twin Coach model 316A of the same era and design as the Mack with a less pronounced radiator under the windshield, and probably making it more difficult to predict its direction of travel! The Macks were COE's but I am uncertain as to whether the Twins were such or had pancake underfloor power plants ala ACF. There was another, earlier I think, model Twin with underfloor engines and side-mounted radiators with the back doors behind the rear axle. You really couldn't tell whether they were coming or going. I know I've seen pictures of them in books and probably online but can't remember where just offhand. PE or one of it's subsidiaries had some and there is a picture of one of them somewhere in the San Fernando valley taken in the late 20's or early 30's. It was a modern-looking bus for it's day. Good find (the model) making you absolutely correct in your assumption. I only remember the later Twins with the front radiators. But, now that I think about it, it is probable that some New York operators such as Avenue 'B' and Comprehensive may have had them in their repertoires. I'll try to do a little more digging! 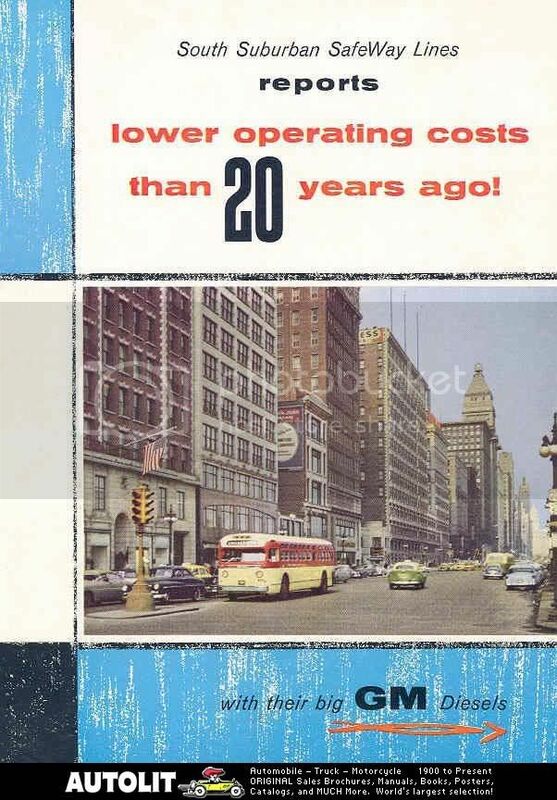 In the red drawing from Mack, the metal visor and general boxy appearance recalls for me the buses used by Comprehensive on the 65th Street crosstown in Manhattan. Note the wider front door, unlike the cramped entrance to an RTS. I recall turnstiles on the 65th Street (transverse) route. I wonder whether my memory of the model is correct. Thanks for posting this drawing! Your 1952 'GM' hit parade! 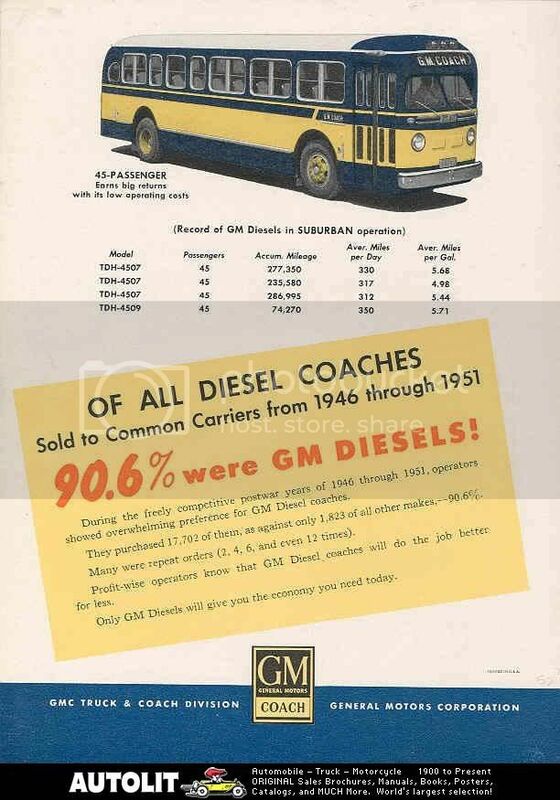 One note; In the ad they say; "During the 'freely competitive' postwar years of 1946 through 1951 operators showed overwhelming preference for GM Diesel coaches (dah! I wonder why!? wasn't that what they were supposed to do?). Thanks for posting the great GM advertisement, Mr. Linsky! I wonder if any of today's transit agencies are interested in such things as economically priced buses that are economical to operate? It seems like the only thing that goes these days is what's mandated by the federal government so they can get their doles. 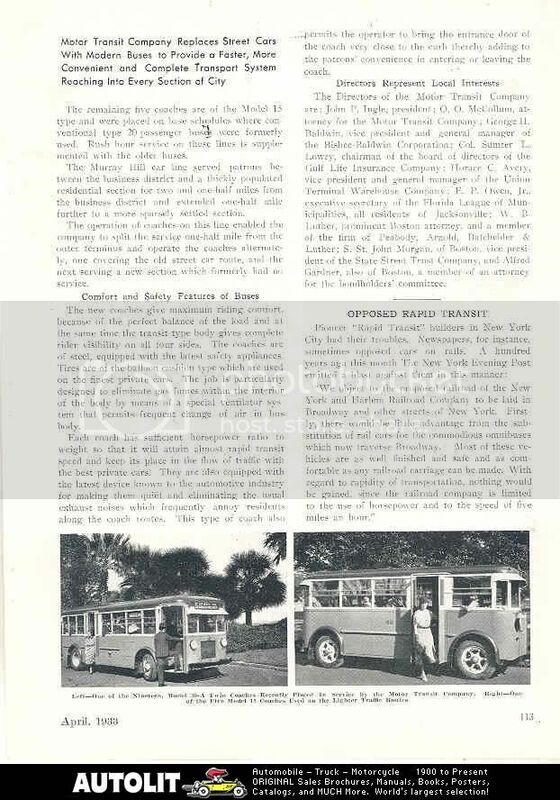 What beautiful buses they are in the advertisement and how economical and comfortable they were when there was a full compliment of nice soft seats instead of hard benches placed around wheel wells as on the new ones. Give me the old days any day! It was a wonderful era that was enjoyed by 150 million less people (that's one of our major most problems now - too many vying for too few resources! - the baloon is going to break some day - mark my words!). Yes, buses were built of solid quality and meant to last lifetimes and that is just one of many things that we can no longer enjoy. You talk about the comfortable genuine leather seating; unfortunately, in the world we now live in bus seats have to be 'slice proof' - what can I tell you? Every time we reminisce about such things we end by saying that if there were a time machine we would be among the first to take it back to the good old days! I'm probably concentrating on this forum and digging up all these old ads to bring us back to those times even if only through pictures! 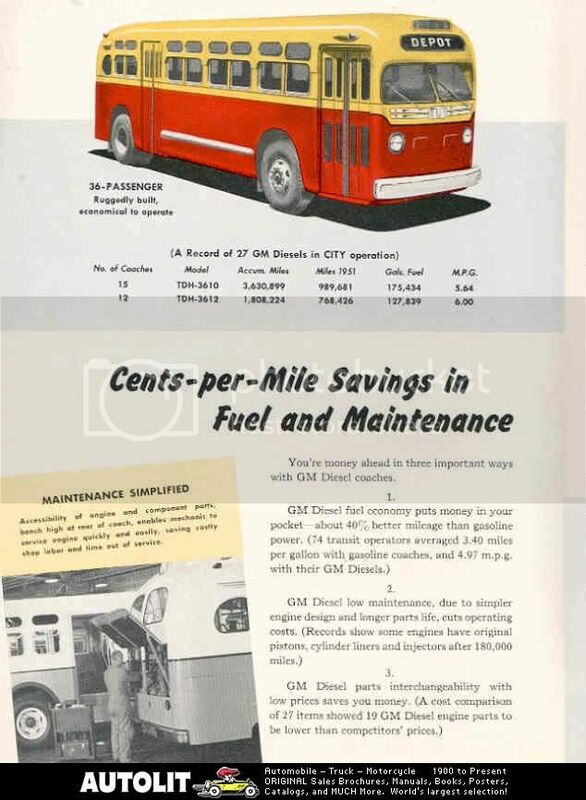 Pictured below is a 1955 GM Diesel brochure featuring the buses of South Suburban SafeWay Lines in Harvey, Illinois. 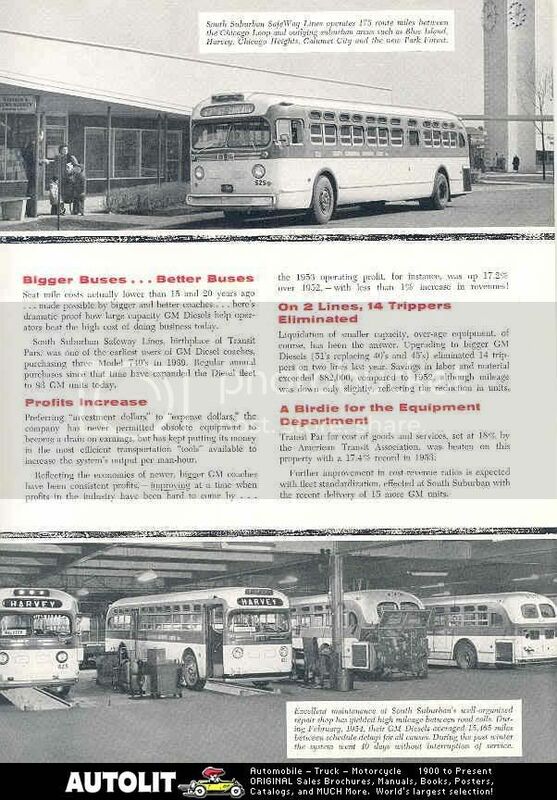 The company operated 19 TDH 5105's which were purchased between 1953 and 1957 and were numbered in their 500 series. Notice the earlier 4506's and 4507's being serviced at South Suburban's shops. South Suburban was a staunch GM customer buying some of the very first 'Yellow' model 740 Diesels in 1939. Great advertisements Mr. Linsky! It was wonderful when a bus manufacturer had to offer a quality product in order to generate sales, instead of concentrating on being the lowest bidder. When is the next trip on that time machine scheduled to depart? I'm working on the next trip as we speak and should be ready for production later today - thanks so much for the compliment! Most if not all major transit operations across the country are now municipal and are, at least in the State of New York, considered to be political subdivisions. As such, they are constrained by law to entertain at least three bids for any equipment exceeding a suggested price which was $2,500 (what it is today - I don't know). However, this does not necessarily mean that they are forced to accept the lowest bid. In a circumstance where two bids come in within 'ball park' of one another and the third is so low that it becomes suspect, then they have the option of taking one of the two higher offers. PBL's, on the other hand, had no such government oversight except where by-laws of the company were designed to protect stockholder's interests. Mr.Linsky. Nice advertisements. That's when Buses where made good. Not like the things they call Buses today. "Pipe"